After London, the Burrell Collection from Glasgow is now exhibited at the Cantini Museum in Marseille. Several reasons explain this unexpected event. The Cantini Museum in Marseille hosts the Glasgow Burrell Collection until September. There are many reasons for this unexpected stopover on the shores of the Mediterranean Sea. The Glasgow Museum is closed for work until 2020. This was the occasion for the famous collection to come out of its traditional walls. First stop : London, where the collection was hosted by the National Gallery from September 20, 2017 to April 30, 2018. Why Marseille? This choice is explained by the twinning of the two cities that were in turn European capitals of culture in 1990 and 2013. The link was thus found and it was enough to organize this exhibition. A step that is all the more important than the Burrell Collection left the country for the first time; a rule dictated by William Burrell himself and that only a vote in Parliament was to override, which was done. The Burrell Collection exhibited in Marseille, however, takes a completely different face. In London, it was an ode to Degas. All the works by Degas - the whole collection - were exhibited there. In Marseille, it is different because on roughly sixty works presented, Degas only appears with four works of which The Rehearsal is certainly the most famous one. With Daumier, Degas is certainly the best represented but we also can admire the Roses dans un verre de Champagne by Manet, l'Eglise de Noisy-le-Roi by Sisley, Mademoiselle Aube de la Holde by Courbet and, of course, the Château de Médan by Cézanne. By 2020, the Burrell Collection will be back in the Glasgow Museum. Marseille will have been a major step in the international presentation of this collection. 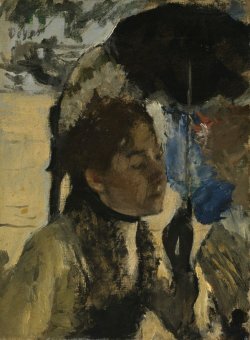 Burrell Collection: Réalistes et impressionnistes at Cantini Museum in Marseille (website: culture.marseille.fr/actualites/collection-burrell-courbet-degas-cezanne-cantini) until September 23, 2018.